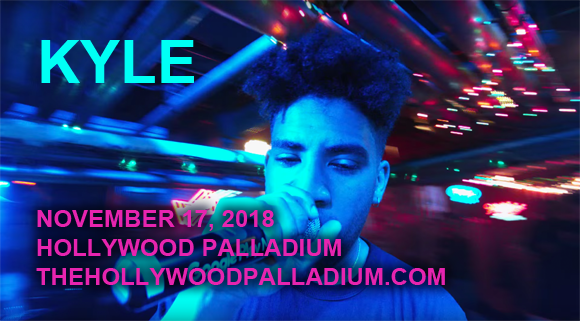 Fresh from touring North America as a power trio with Logic and NF, rising star singer and rapper Kyle comes to Hollywood Palladium on Saturday 17th November 2018! The chart-topping sensation is embarking on the Lightspeed World Tour, a headlining tour in support of his red hot debut album Light of Mine, marking his biggest stint on the road so far! According to the man himself, fans are gonna get "the best show they've ever been to!" Don't miss your chance to see the eclectic artist and star of Netflix's The After Party live! Originally known as KiddKash and K.i.D., American singer and rapper Kyle first began to make noise in the hip hop scene in 2010, releasing mixtapes such as Senior Year, Second Semester, FxL, Super Duper, and K.i.D. Kyle's 2015 mixtape Smyle featured guest appearances from Chance the Rapper, Jesse Rutherford and Yuna, and peaked at number seven on Billboard's US Top Rap Albums Chart. That same year he was named by Rolling Stone as "one of the ten artists you need to know". His breakthrough single, "iSpy", featuring Lil Yachty, was released in December 2016 and peaked at number 4 on the US Billboard Hot 100and number 14 on the Canadian Hot 100. This led to a major-label record deal with Atlantic Records in February 2017. His debut studio album, Light of Mine, was released in May 2018 and features guest appearances from Kehlani, 2 Chainz, Sophia Black, Khalid, Take 6, Avery Wilson, Lil Yachty and Alessia Cara.